Other Thoughts: Bought this ram for an HP Z420 Workstation that I bought here on newegg. The memory was instantly recognized and recorded 31.3GB of available ram. No issues or complaints. Pros: ECC Memory was installed in HP ML10v2 server running FreeNAS 9.10. It was recommended by homeservershow site for use in ML10v2. Has been running 24/7 for three months without a problem. Memory was tested with MEMTEST86+ and passed with no problems found. Other Thoughts: Time will tell, but so far, so good. 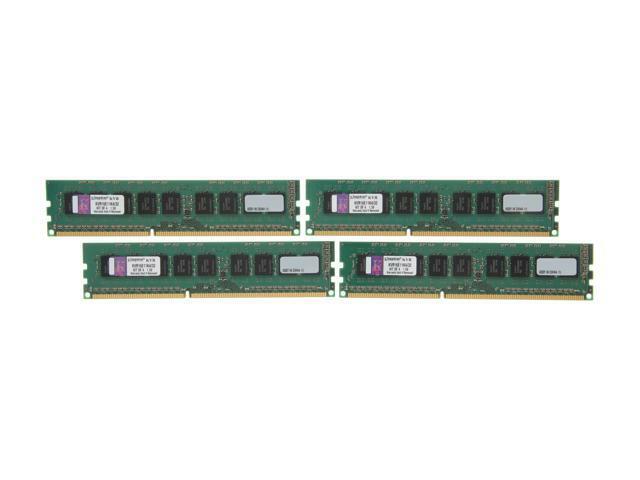 At the time of purchase these ECC memory modules were the lowest GB/dollar solution for the HP ML10v2. Happy with purchase. Pros: ECC - Immensely important given modern memory usage requirements. Other Thoughts: In use on a server with ASUS M5A94-R2.0 motherboard and FX6300 CPU @ 3.5GHz base clock. Thermal reporting is very handy to check on the health of your memory sticks, particularly under load. ECC Memory used to be an obscure requirement of "servers" and was almost unknown to "desktop" users. That was in the days when servers had "lots" of main memory and desktops had very little; those days are gone. Desktops and "gaming rigs" today have enormous amounts of memory in comparison; and that memory does fall victim to natural radiation. Imagine the impact of a 1-bit flip when preparing your tax return, or an undetected error in a game simulation you have been working on for months. Kingston has been offering ECC memory to customers at attractive price points for a long while now, rendering objections to the cost of buying ECC memory largely moot. Pros: Good RAM. Appears to be working. No crashes. Cons: Can't tell if it is working or not. Pros: Works fine when it is working. Kingston tried to resolve our RMA request by sending out a single module one time, but will not assist after that initial instance. Seeing has how we have well over 20 sticks of these the future isn't looking too bright. Cons: If you are part of a IT department or a business or even a power user, we suggest you don't buy any kingston kits if you plan to ever split your memory between different machines or your warranty is in jeopardy. It is not an uncommon practice to split kits depending on availability of a certain memory type or as needs change within your IT environment. They will demand that you return the memory as a full kit if one of them fails, either forcing you to take your server offline completely while you wait for replacement or travel the country trying to find matching sticks if you have happened to have split them in different servers in your operations. They do not have a polocy to assist you by sending a single stick as a replacement nor offer you a suitable resolution as their policy stands. Newegg should put a warning on all RAM kits if the manufacturer has this requirement so you can decide if you want to take the risk of splitting. The cost of these ECC modules is no joke but the policy requiring return of full kits sure is. I'm sure Kingston isn't the only memory manufacturer to have something like this, but this is inconvenient for the customer. We apologize for any confusion. A memory kit is considered one part with multiple pieces and are replaced as a whole should that ever be needed. We do offer advanced shipment where the replacement can be sent out first and then the other returned to us. We are here to help and can work with you in special cases. We are here to continue to help should anything else come up. Please call us at 1-800-435-0640 (USA and Canada only) M - F 6am - 6pm PT and an available technician will be able to assist you. Thank you for using Kingston memory. Pros: ECC isn't something you can readily test. But in my case I was able to see it working. My original motherboard (ASRock E3C224D4I-14S) was apparently causing memory problems. I would get several ECC errors in my system log (dmesg command in Debian) every day. I eventually tried a different motherboard (with the same RAM) and that cured the errors. But it was cool seeing the log entries that showed this RAM's ECC was working. Other Thoughts: Running in a Dual CPU AMD server that is constantly running. Pros: Flawless performance and reliability. Tested with Memtest86+ for five passes (all available tests) with no errors. Enjoyed my workstation for about a year with virtually nil crashes. Cons: Its a bit pricy but quality costs. Pioneer Blue-Ray and DVD burners.